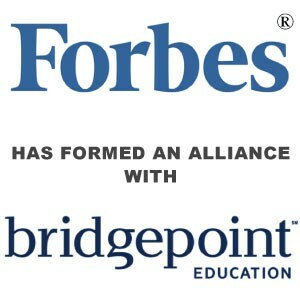 Bridgepoint Education's Ashford University and Forbes Media Form Alliance - Berkery, Noyes & Co., LLC. SAN DIEGO, Nov. 5, 2013 /PRNewswire/ — Bridgepoint Education, Inc. (BPI) has announced an alliance between its Ashford University’s School of Business and a subsidiary of the global media company, Forbes Media. Ashford’s College of Business and Professional Studies will now be known as the Forbes School of Business. Through their studies, students of the Forbes School of Business will gain online access to a vast treasure trove of Forbes’ resources, from curated talent and high quality content dating back almost a century, to an extensive global network. Unique, invitation-only speaker series and webinars will feature business experts culled from Forbes’ roster of approximately 1,200 international contributors. Forbes’ contributors may also be available to serve as guest lecturers, sharing their expansive knowledge with Ashford’s online students. Berkery Noyes provides strategic mergers and acquisitions (M&A) advisory and financial consulting services to middle-market companies in the United States and internationally. The firm has been involved in many notable transactions in the information and education sectors, including Weld North’s acquisition of JBHM Education Group; Cambium Learning Group’s acquisition of Class.com; McGraw-Hill Education’s acquisition of Bookette Software; and Rockbridge Growth Equity’s acquisition of NorthCentral University. For more information, visit: www.berkerynoyes.com.